I have to apologize for not being attentive in my blogging. I have been overwhelmed by work/classes and housely duties that I’ve ignored for too long. 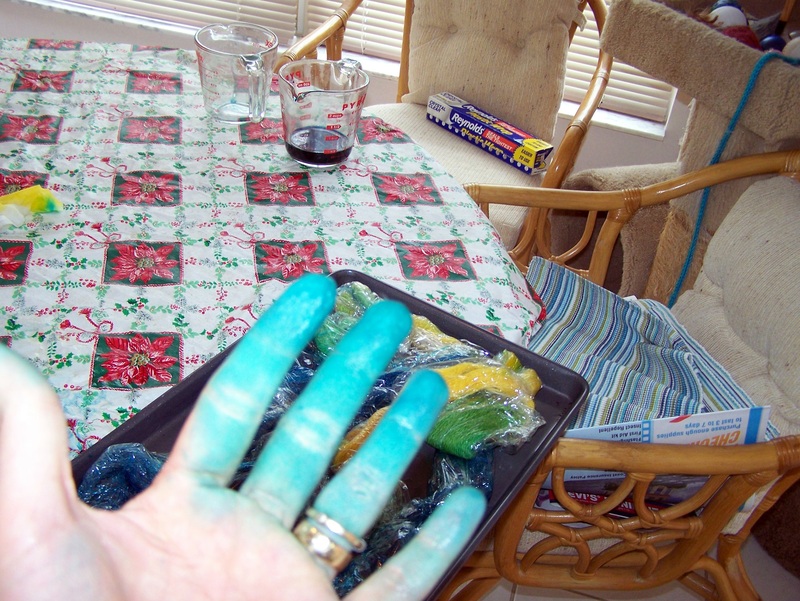 I did have some more fun this weekend with food dye. 1- On my needles: 1 entrelac baby blanket still in progress. This will last the rest of my life 2- Mulberry Hat from Modern Top Down Knitting which is coming out too big and has been put down till I have the brain power to figure out where I went wrong. 2- On my wheel, brown alpaca from Nancy in our spinning group. 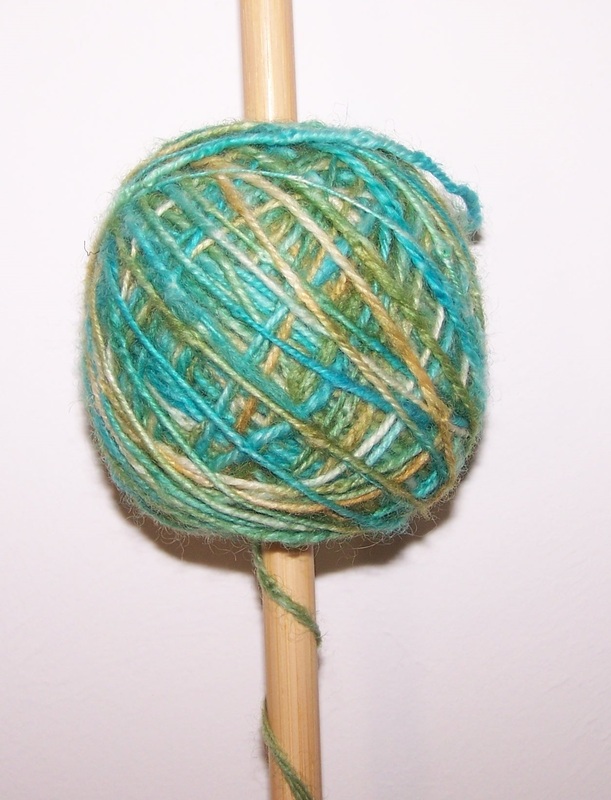 I want to make a four ply yarn for a jacket/sweater with three parts wool one part alpaca. Florida is one of the few places where “You know, Alpaca is really warm. . .” could be a bad thing. 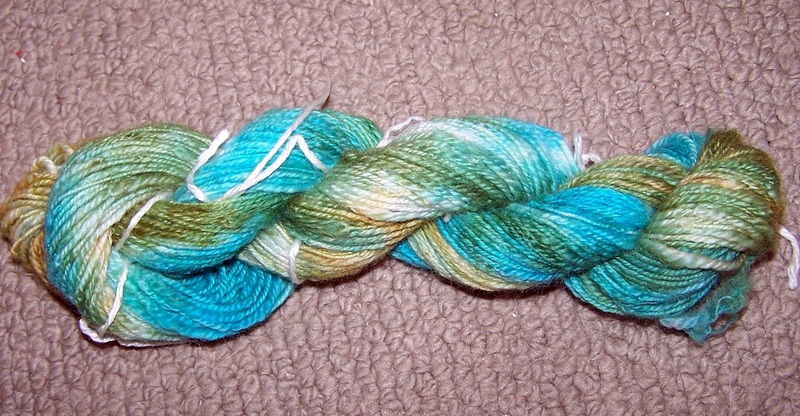 3- Out of my dye pot. 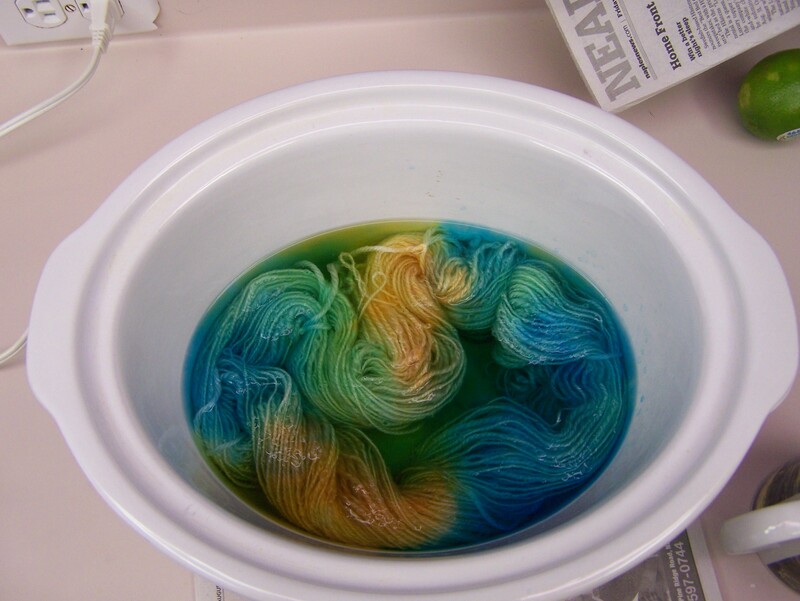 Okay, this was never actually in a dye pot. 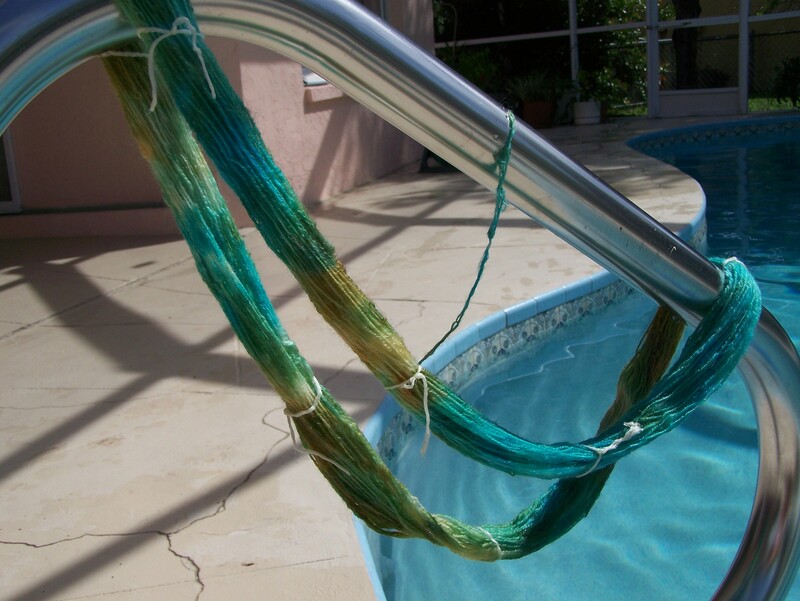 I used the Knitty instructions with the Cold Pour Method. I thought this came out wonderful. I even created a giant niddy noddy with pvc to skein it up. 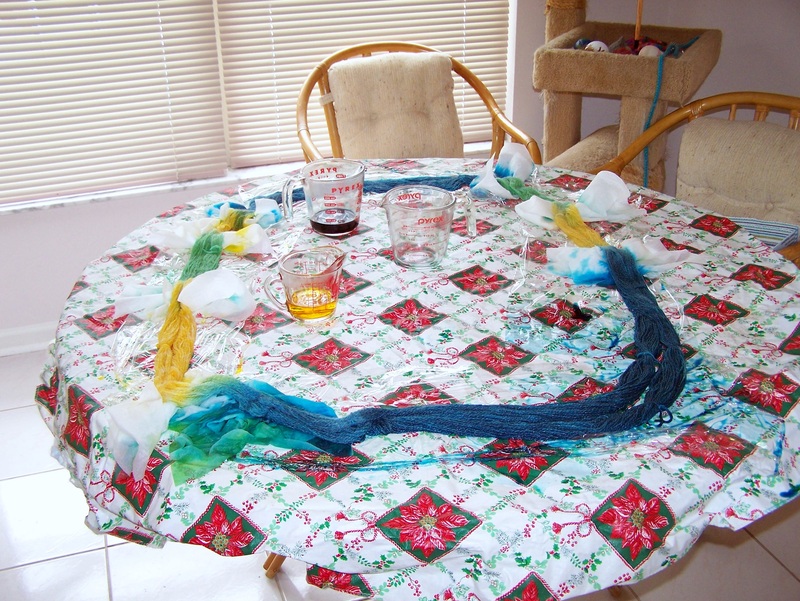 I put an old plastic Christmas tablecloth on the kitchen table before I started. 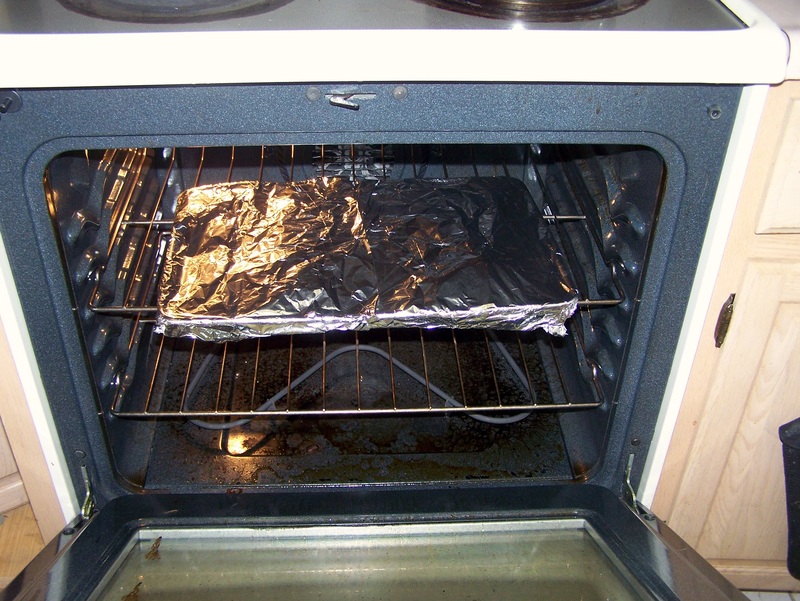 I wasn’t sure how messy this would get. 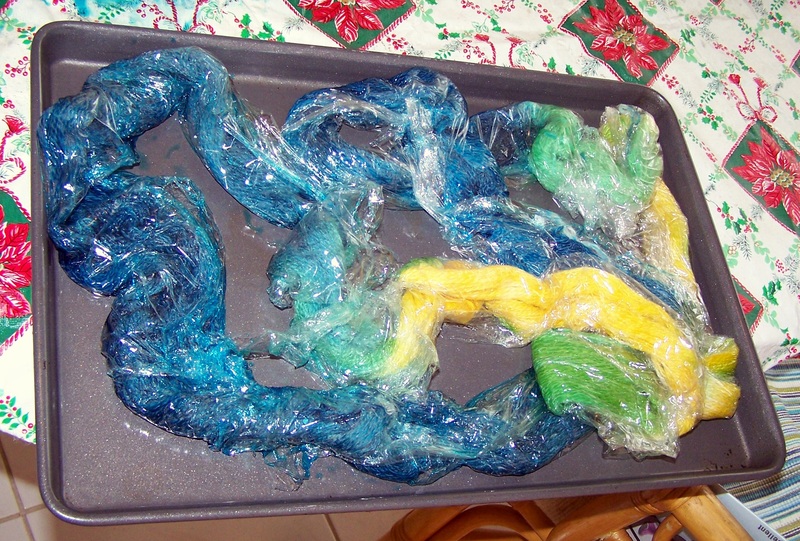 I did put paper towels under the different colored sections to prevent mixing. 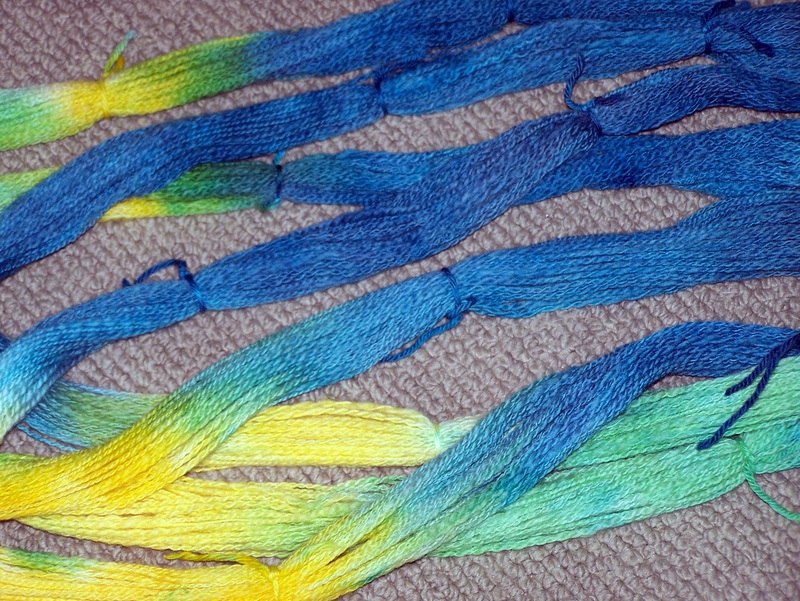 As you can see from the pictures below, I wound up with blue hands and there is a green fingerprint in a yellow section of yarn. All in all, I think it was great. I’m sending this off to Mom so I won’t have finished project pictures unless she provides them. It seems like there are now social network sites for everything. I’m one of those people who are completely addicted to Facebook but do not want to admit it. 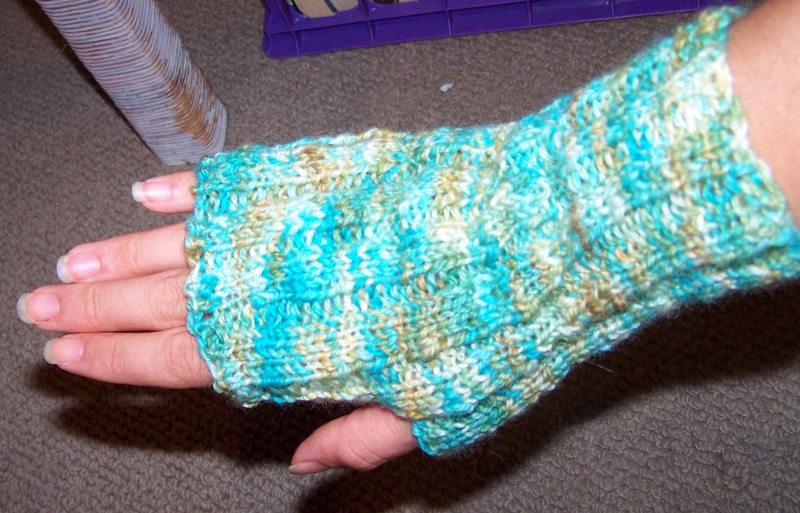 I’m an online junkie who needs to recheck everything, including my knitwerks site, regularly. I wake up, take a shower, go online. 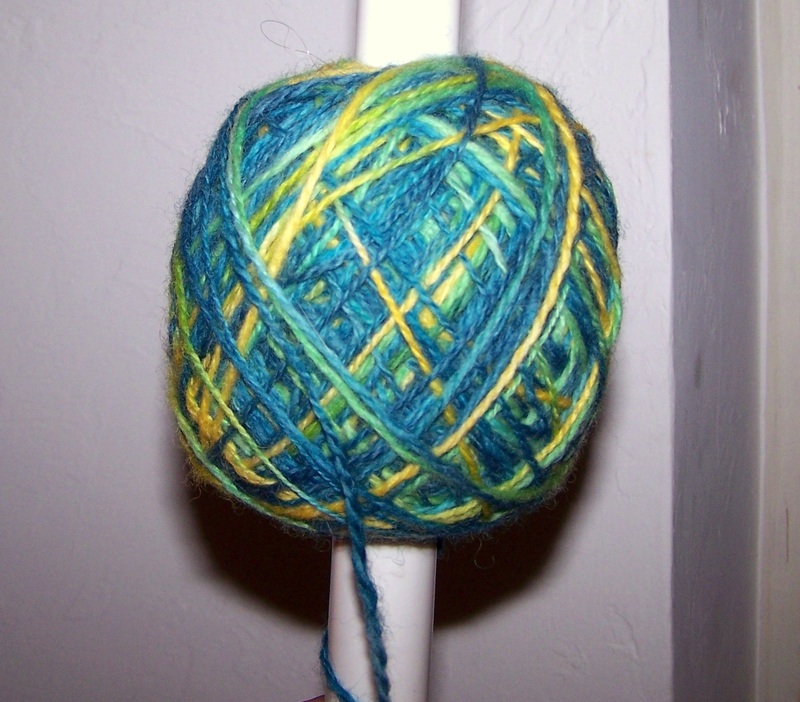 There are many knitting social network sites out there, but my favorite and probably the most popular is Ravelry. 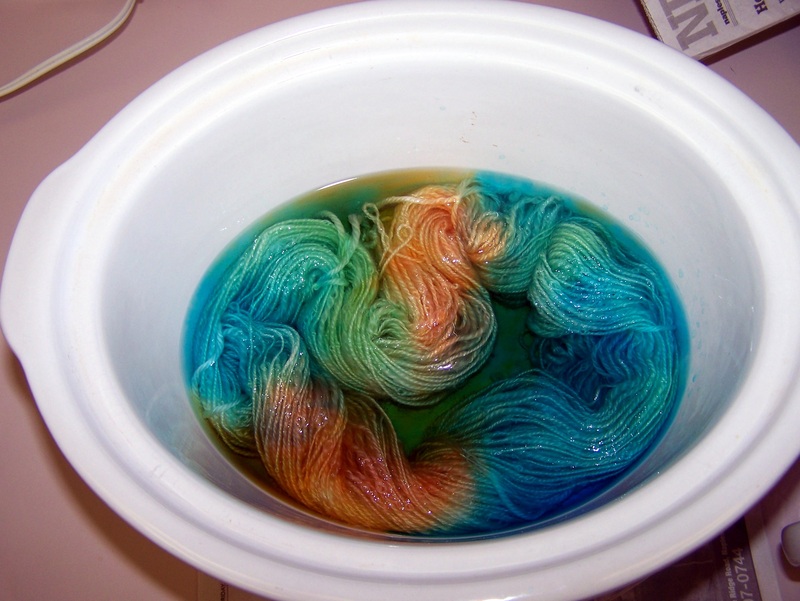 It is a community for knitters, crocheters, spinners and dyers to join, share, and talk about the crafts they love. There are thousands upon thousands of patterns available both free and for a fee. You can search by yarn, by needle size, or even designer. Their notebook section allows you to add yarns, needles, books and projects. It is a great way to organize that mess of a stash you may have! One of my favorite features is the groups. 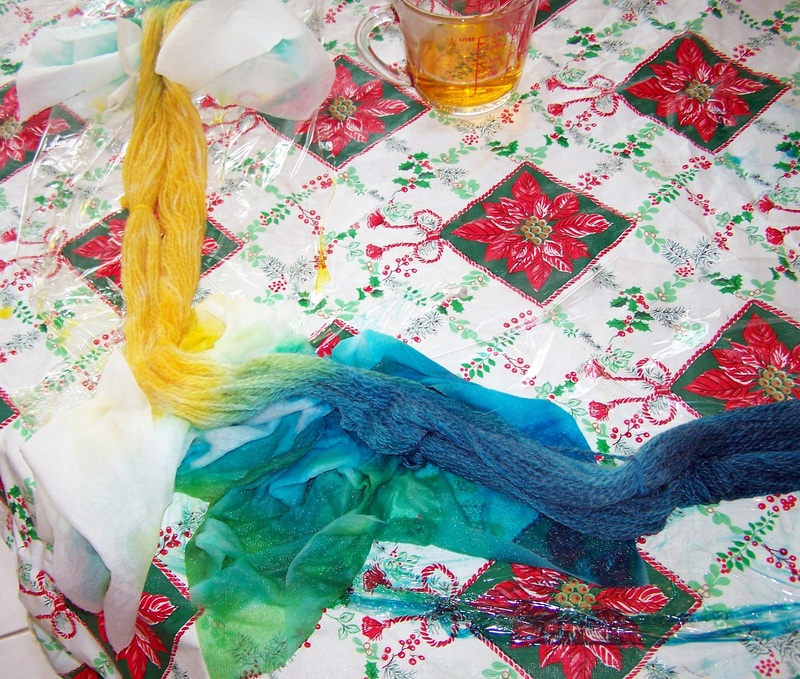 You can join other crafters based on favorite tv show, region, school, or similar interests. There is a group for Knitty fans, for tea lovers, for cat people, for House fans and for nearly every local knitting shop. Inside, you can commiserate, discuss events, and share projects that you are working on and have finished. I love to browse the patterns. You can use key words to help guide your search, but I generally wander aimlessly through page after page of recently added items, favoriting the ones I like the most in hopes that I come back to it. This is a great inspiration and makes me warm and fuzzy inside.